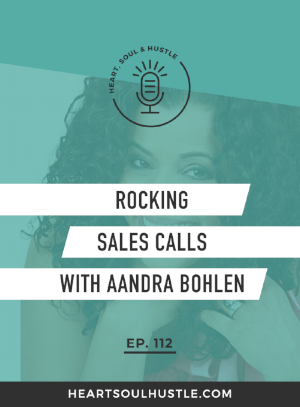 On today’s episode I’m inviting back a special guest - my “secret weapon” when it comes to sales, Aandra Bohlen! Anytime I need to have a sales conversation with a qualified lead, I talk to her. You’ll hear why Aandra doesn’t call what she does “closing”, and you’ll learn the exact framework for sales conversations that she uses to get a win-win result for both her and the prospect. Aandra works directly with businesses, helping entrepreneurs with their enrollment process. She shares that selling is a true expression of how they show up in their businesses, because if they’re not selling, they’re not showing up! Selling is different than marketing, in that it’s an active opportunity to engage and connect with people, moving them to a state of transformation. High-ticket sales will require a deeper conversation with a potential client, because there’s higher risk involved from a price standpoint. Aandra says that having these intimate conversations is a skill that everyone needs to acquire, and it can be learned. First and foremost, you’ll need an actual willingness to do sales. Next, listening to fully connect, and not just respond, is crucial. Finally, you need to be able to put yourself in the prospect’s shoes and fully understand his or her pain and struggles in order to anticipate the proper way to proceed with the conversation. Her intention isn’t to make a sale when having a conversation, but rather to bring the call to completion where everyone wins. Also, Aandra never shames the prospect into purchasing. Sales calls got easier for me when I realized that I’m not fighting to get a “Yes”, but rather I’m fighting to get a decision, and like Aandra says, bring the call to completion. Prospects enter a sales call looking for answers, and it’s our responsibility to help them see what those answers are. We must be transparent heading into the call though, with the intent of telling the truth. Her framework consists of: inquiry, investigation, impact and invitation. Aandra feels that about 70% of the sales call is about asking good questions and then listening. You have to be willing to be curious, and remember, you can’t serve until you sell the solution!